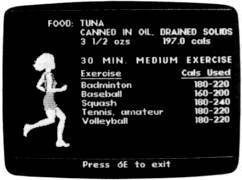 Among several new programs introduced by Bantam Electronic Publishing are The Complete Scarsdale Medical Diet ($39.95) for the Apple II series and IBM PC/PCjr, and The Fourth Protocol, a graphics and text adventure game based on Frederick Forsyth's bestselling novel, for the Commodore 64/128 ($34.95) and Apple II series ($39.95). Two adventure programs, the first releases in Bantam's new Choose Your Own Adventure Software Series, are being introduced in September. Entitled Escape and The Cave of Time, the programs are based on the popular series of books published by Bantam Books, Inc., the software division's owner. They will be available for the Apple II series and for the Commodore 64/128 at a suggested retail price of $34.95. the IBM and Apple computers. Bantam has also announced its Micro-Workshop Series of learning software for children. The first three titles in the series are Fantastic Animals (ages four through nine), Creative Contraptions (ages seven and up), and Road Rally U.S.A. (ages ten and up). The emphasis in each package is to encourage creativity while teaching basic learning skills. The IBM PC/PCjr and Apple II-series versions will sell for $39.95, while the Commodore version, to be ready this fall, is set at $34.95. Circle Reader Service Number 237.